Well, we weren’t going to win every single game, but it kind of felt like we would. The Cubs saw their six game winning streak come to an end at the hands of Rockies’ sinkerballer Aaron Cook. Those red hot bats finally cooled, that great defense had a costly error, and a real weakness of the team was exposed. I am still happy with a split against Colorado. Everytime you roll through that lineup, it is full of great hitters. Helton, Holliday, Atkins, Hawpe, Tulowitzki. Just scary, and the Cubs still won the first game and came close to winning the second game. The Cubs just need to bounce back against the Nationals. run to Chris Iannetta in the seventh inning to pur the Rockies ahead 2-1 in the seventh. Nice to see Marquis have a quality start. On the flip side, Cook was able to cool off the hot Cubs’ bats. Therior, Lee, Ramirez, Fukudome, and DeRosa all went hitless. When your 2-6 hitters don’t get any hits, you aren’t going to win many games. Yet, even with such a bad offense day, the Cubs were still very much in it and had a chnace to win the game. Down 2-1 in the top of the eighth, the Cubs looked like they would pull off another miracle win. Geovany Soto started out the eighth with a single and Ronnie Cedeno came in to pinch run. Felix Pie, the only Cub with multiple hits on the day, hit a single up the middle to put runners at first and second. Pinch hitter Daryl Ward drew a walk to load the bases with one out. Mike Fontenot hit a groundball towards second base, but he hustled to first to break up the double play. With the game tied and only one out and Derek Lee on deck, Ryan Theriot hit the ball right at first baseman Todd Helton, who doubled off Fontenot to end the inning. Wednesday night, Theriot gets it past Helton for the game winning hit and he’s a hero. On Thursday it ended a potential big inning for the Cubs. With the game tied in the bottom of the eighth, the Cubs big weakness so far was exposed. The Cubs starters, other than Zambrano, have struggled to get past the fifth inning. Lilly, Hill, Dempster, and Marquis have only been going four or five innings, putting a lot of miles on the Cubs bullpen. Every one of the Cubs bullpen staff has pitched ten or mroe innings. Not only that, but two of them are really struggling, Kevin Hart and Michael Wuertz. Wuertz was second in the league in stranding inherited baserunners last season, behind his teammate Carlos Marmol. This season, Wuertz has ptiched 10.1 innings , given up 12 hits, seven earned runs, and three home runs. Hart came up late last season and looked impressive, making the playoff roster over Jason Marquis, but this season he has struggled. Hart took the loss today, but it wasn’t entirely his fault. Alfonso Soriano told reporters he won’t be going to the minors to rehab from his right calf injury he suffered on April 15th. You know Cubs fans aren’t going to tbe happy with this, but there is a reason that Lou is 14th on the all time list for winningest managers. I know that somehow, someway, he will do the right thing. The Cubs need to get a new winning streak started on Friday when they head to the Capital to face the Washington Nationals. Despite a new ballpark, the Nats haven’t been too impressive. The Nats will throw three lefties against the Cubs. That means Johnson will lead off for those three games. Ryan Dempster takes on lefty Odalis Perez. Dempster hasn’t lost a game and Perez hasn’t won a game. Perez has pitched well and has been a victim of horrible run support and bad defense. Zambrano will take on Matt Chico in the second game of the series and Lilly will square off against John Lannan for the finale. Let’s get back to our winning ways! I feel like somehow I keep getting transported to the past, maybe by a time machine, to Cubs seasons’ past. This 2008 version of the Cubs seems very similar to the 2007 Cubs after the first two weeks. Bad baserunning, bad defense, bad bullpen, walking to many batters, not taking enough walks, and no clutch hits. There are two big differences beween the 08 and 07 Cubs. In 07, the Cubs at least had some starting pitching. This season, the Cubs bullpen has worked more innings then any other team in baseball. Both of their starting lefties, Rich Hill and Ted Lilly, cannot get out of the fifth inning. The other big difference is that somehow, some way, the Cubs are actually winning games, especially one run ballgames and extra inning games. As bad as it looked in Pittsburgh and Philly, the Cubs actually are coming home after a winning road trip after taking the final game of the series against the Phils, 6-5. Some of those bad breaks that went against the Cubs last year are starting to go our way. 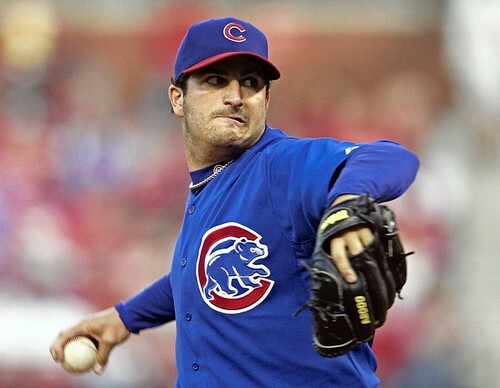 Jason Marquis, recovering from strep throat, was able to weasle out of plenty of jams and keep the Cubs in it. Marquis loaded the bases with one out and only gave up one run. The Cubs were able to jump out in front thanks to three singles by Henry Blanco, Alfonso Soriano, and an RBI single by Reed Johnson. 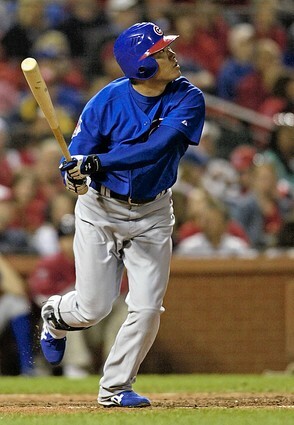 Derek Lee then hit a double, driving in two more runs and giving the Cubs a 3-1 lead. Jason Werth made it 3-2 on a leadoff homer by Jason Werth, in the bottom of the fifth, but Mark DeRosa returned the favor by hitting a leadoff homer in the top of the sixth that went over the foul pole. Phils’ manager Charlie Manuel was thrown out after arguing with the third base umpire. With the Cubs leading 4-2, Marquis was done for the day and Michael Wuertz, who has been one of the most reliable relief pitchers came into the game. Wuertz gave up a solo home run to Eric Bruntlett to start out the inning, then gave up three singles in a row, tying the game 4-4. With runners at first and third and no outs, Sean Marshall came into the game and got Chase Utley to fly out, but the go ahead run crossed the plate. Marshall and Marmol finished the inning with the Cubs now down 5-4. 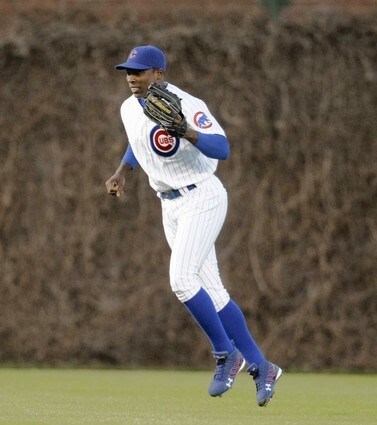 In the top of the eighth, former Cubs Tom “Flash” Gordon came into the game. He got Fukudome to strike out swinging, but then walked Mark DeRosa. DeRosa was replaced by pinch runner Ronnie Cedeno. 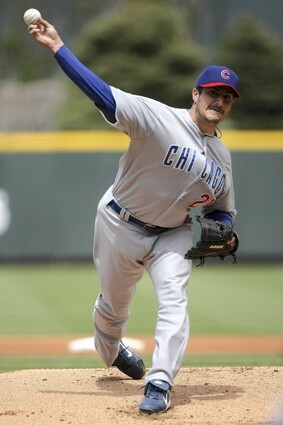 Ryan Theriot hit a single, and the Cubs had runners at first and second with one out. Felix Pie was announced as the pinch hitter, but then the Phillies changed pitchers, bringing in lefty JC Romero to pitch. Lou called Pie back and brought in Geovany Soto. Cedeno then stole third on a very close play, putting runners at first and third. Geo Soto then tried to check his swing, but the ball hit the barrel of his bat and inbetween the first and second baseman, tying the game. Closer Kerry Wood came into the game in the bottom of the eighth, and only gave up a single. The Cubs did nothing in the top of the ninth, and then the bottom of the ninth was heart pounding. Tell me if I am the only one that thinks this, but once again, my time machine came and took me back to 1989. When Kerry Wood comes into the game, do you feel like you did when Mitch “Wild Thing” Williams, came into the game. You are either going to see amazing stuff, or be scared half to death, or both. In the bottom of the 9th, he walked the first batter he faced, Pat Burrell. Burrell was pulled for pinch runner and former Cardinal So Taguchi. The next batter, Pedro Feliz, bunted the ball and Wood made a dangerous throw to second to get Taguchi out. He then hit pinch hitter Greg Dobbs, putting the winning run at second with only one out, but he got Eric Bruntlett to strike out. With two outs and runners at first and second, Derek Lee made an amazing play to snag the game winning double from Carlos Ruiz to keep the game alive. position players on the bench, Lou called on Carlos Zambrano to pinch hit for Kerry Wood,. Z hit a ball to the shortstop for what would’ve been a 6-4-3 double-play, but Z was hustling down the line and Chase Utley’s throw was short and got past first baseman Ryan Howard. Cedeno was able to score the go-ahead run. Of course, nothing is easy for the Cubs. Bob Howry came in for the save and quickly got the first two batters out. He then gave up a double to Chase Utley that was about one foot away from being a home run. With Utley on first, Howry intentionally walked Ryan Howard. The next batter would have been Burrell, but he was lifted in the ninth for a pinch runner and So Taguchi took his place. Taguchi grounded out to end the game. Besides the obvious pitching woes, the Cubs offense has been spotty at best. Lou addressed this after the game. There. Someone finally said it. The Cubs are not a patient team. You can just see it, especially against pitchers like Brett Myers the other night or Cole Hamels. The Cubs just hack away and don’t wait for the right pitch. Tomorrow I will give my two cents on the whole Dusty Baker saga. You all know where I stand on this. The Cubs have a tough series ahead with the Cincinnati Reds. The Reds are coming off a tough sweep to the Pittsburgh Pirates. 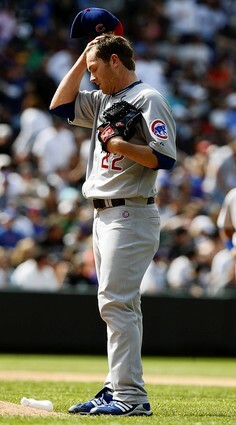 They will send Aaron Harang to pitch against Ryan Dempster. Tensions will be high and it will be interesting to see if the Baker factor will add some more fuel to the fire.